One of the things I'm most excited about with our upcoming move to New Hampshire is experiencing a traditional New England fall with my family. Just the term "leaf peeping" makes me smile like Nia up above and the thought of looking out of my windows and seeing gorgeous leaves instead of buildings and concrete is already calming my nerves! While we await our move I've already started getting our home ready for fall with the Febreze Home Harvest Collection. With delicious smelling scents like Chai, Toasted Almond and Sugar you can completely immerse yourself in fall by using Febreze spray, in-car vent clips as well as NOTICEables which plug into your outlets. My family's Febreze roots go back to when Mr. Lovebird and I were dating in college. Let's just say some of his uses for Febreze were a bit unconventional (I'm thankful we have our own washing machine now O_o), but especially now with kids it's a great way to give our clothing a refresh and with an infant I like how the scents aren't too overpowering. 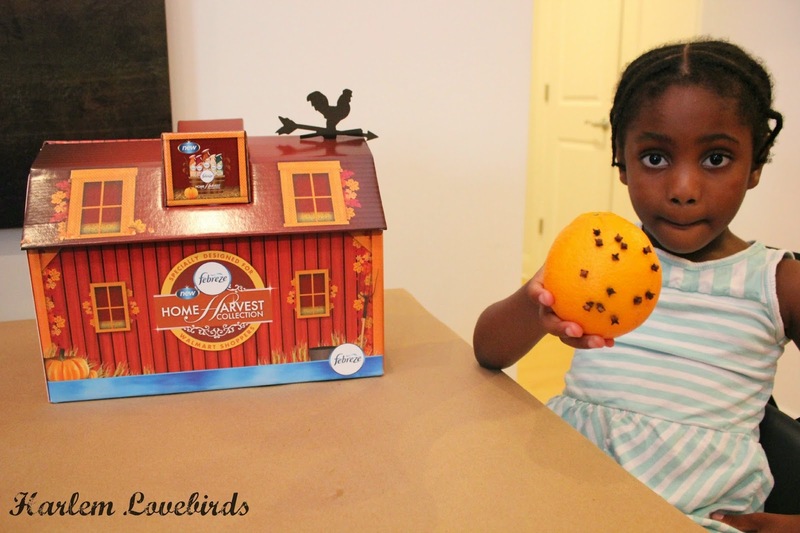 When we received our Febreze Home Harvest scentspiration box Nia thought it was another doll house, which it quickly became once we were finished, but I took her through it and let her scratch and sniff the scents. She deemed Sandalwood her favorite, and I supervised her as she plugged it into our entryway outlet. Nia was a bit impatient for the scent to spread so to pass the time I told her we could pick out one of the many activities that came along with our scentspiration box. She decided on the spiced orange. Back to our project . . .
We gathered our supplies, and I explained to Nia that she could make a pattern with the toothpick then push the cloves in. She was aiming for a face, but got carried away with the toothpick so it's a bit abstract! Besides the spiced orange activity there were also recipes like oven-baked s'mores, an obsession I had in my early 20s, as well as home decor crafts such as light bulb pears - simply wrapping a light bulb with twine and inserting a twig for the stem. 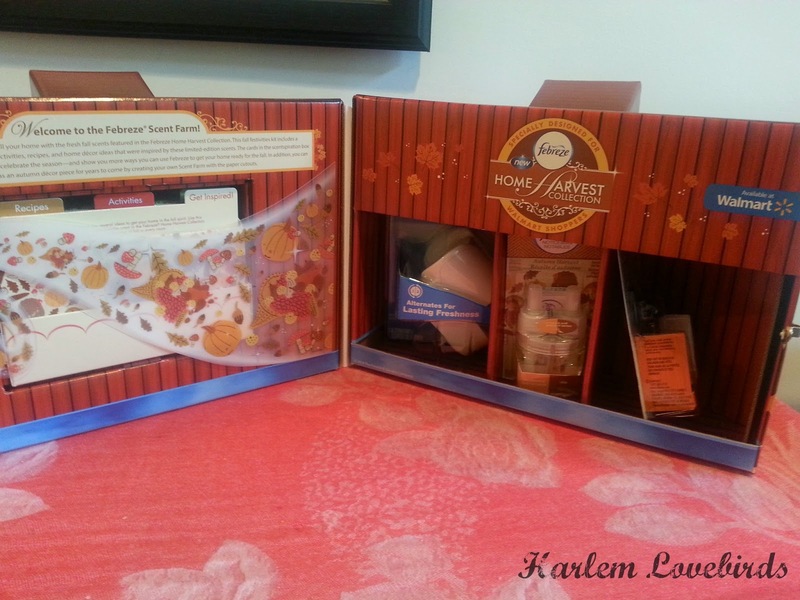 Even better is that the crafts incorporate the Febreze scents. So instead of just spraying them in the air (something I'm cautious about with Grayson!) 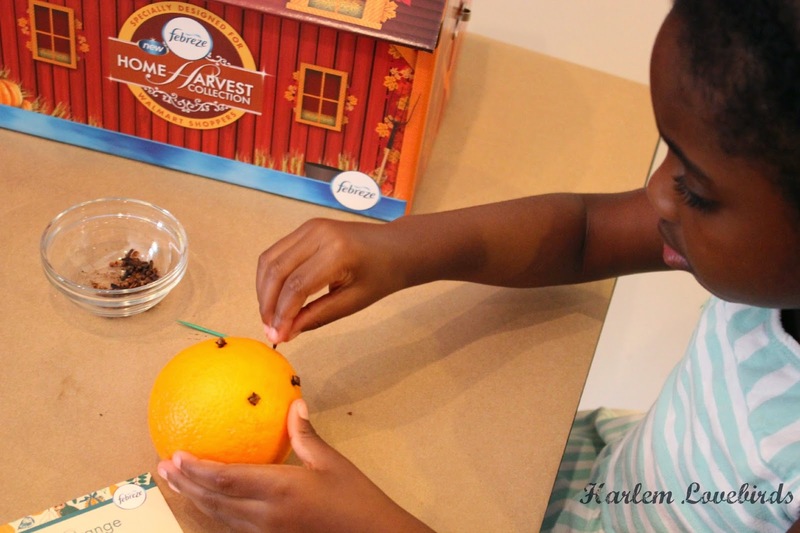 you can infuse the crafts with Febreze making fantastic smelling centerpieces. I never considered that before! 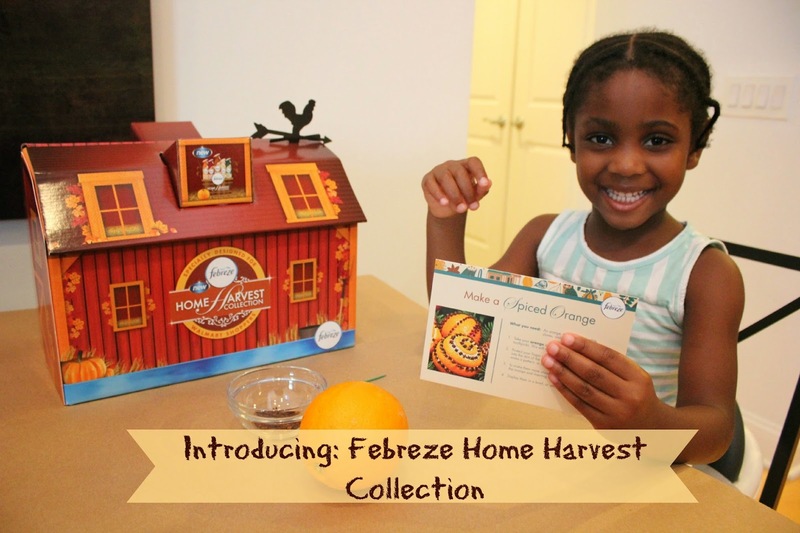 To learn more about getting your home ready for fall with the Febreze Home Harvest Collection be sure to follow Febreze on Facebook and Twitter. Have you started getting your home ready for fall? 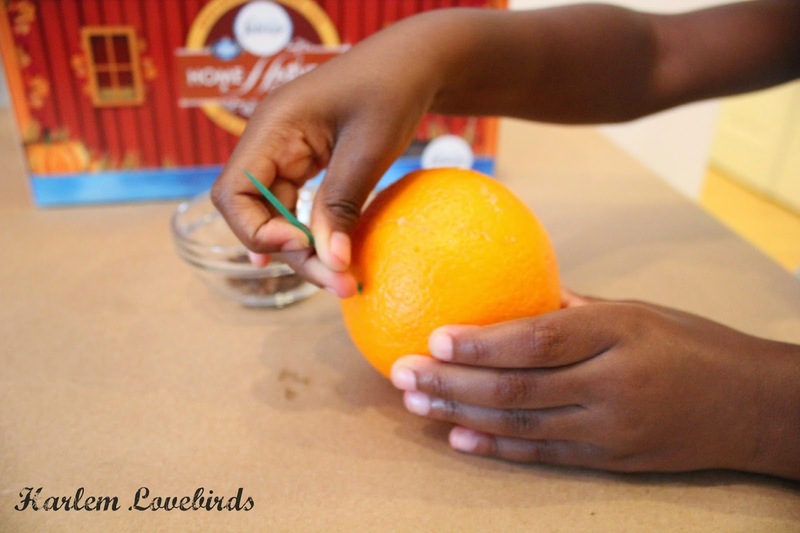 Do you make special crafts or use scents to get in the fall mood?